Rooftop tents offer some of the benefits of a camper in combination with your vehicle for a lot less money than the cost of a camper. I think this is what makes these tents such a good value for the money... But that's of course, if the owner actually uses it! Once the tent is actually mounted to the top of your vehicle, the set up time is much faster than a regular tent. Some are said to be set up in under one minute. Yes, the actual mounting is what can be a pain if you're not the type of person that likes to put things together. See how this guy put his Mombasa car top tent together. He made a nice detailed page about his experience. Since these tents are above ground, it really helps to avoid getting dirt and wetness inside. It's also more difficult for creepy crawlers to get in since it's not laying on the ground. They turn your vehicle into an adventure machine for much less than the cost of a teardrop trailer, pull behind camper, or a motor home. Some of them even have an awning you can sit under! 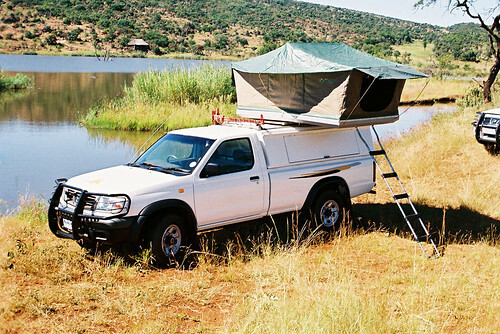 If you have an off road vehicle, these tents can be especially useful. Watch how much Karen and Scott Jennings enjoy their tent set up on their 4x4 below. A rooftop tent can be something to consider if you want something like a teardrop trailer but do not have the room for it. They're aren't as quick to set up as an RV, where you just attach and go, but there's also a lot less maintenance and less spending, too. And it's quicker to set up than a regular tent. "I like this... But what if I can't carry this on my roof?" That's when people use a trailer to carry their “roof” top tent. Plus it gives you the extra room to carry your gear on the extra space on the trailer as well as your rack. This is a light trailer so I imagine that just about any vehicle can tow it. 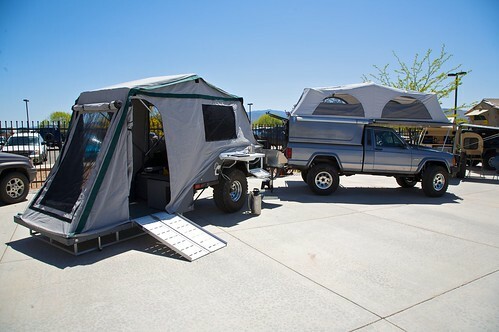 And this can make for “attach to your car and go” type of solution, much like a real camper or teardrop trailer! Some people buy these trailers already set up from a distributor and others buy a trailer and a rooftop tent and put it together themselves their own way. Some of rooftop tents look easier to set up than others. If you're getting one be ready to spend some time getting it installed on your vehicle. The fiberglass ones look pretty simple, but I've never had one. I imagine the more expensive the better quality. I wouldn't want to be dealing with cheap parts because I'm not too handy. Do some research to check your vehicle's weight restrictions. Will your car be able to support you and maybe someone else camping on the roof? For the most part I have seen trucks and SUVs with rooftop tents although I'm sure it can be done on certain cars. Just make sure to do your research! And if you find out anything useful, please share.